So, here I am again, feeling a bit sheepish that I am blogging when I have been ignoring all your gorgeous posts for what? A week and a half? I promise you all, it seems like exams are all I ever do, but these are for real, my final exams ever. For 4 months. For high school. Despite the fact that I am taking quite few holidays after I finish, I will be all yours. Soon my darlings… so soon! But because I have to leave you guys for the journey, as a kind of apology, GIVEAWAY TIME! No, no this is not the massive giveaway I promised (your computer will actually sparkle when it happens!) in my 2 year anniversary post, but it certainly is not something inconsequential! Especially not for any food blogger out there, trust me! 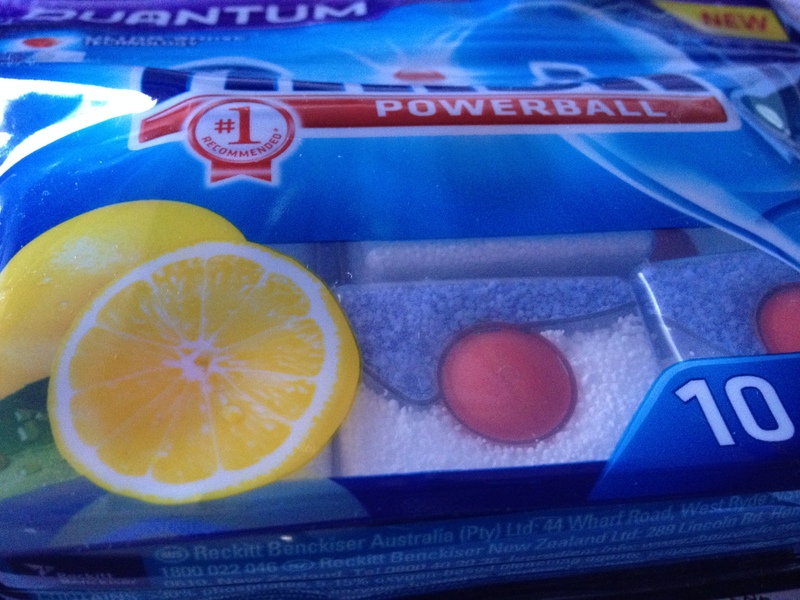 Thanks to the wonderful people at Finish, I got sent wonderful Quantum Finish Powerballs (in lemon!) to test as my choice for dishwashing powder! You all are probably thinking, what is so exciting about washing up? Well, nothing really, I am not going to lie to you! BUT, there is no way around it as a chore for us food lovers, and eating on a clean plate is not only hygienically the done thing, but it feels smooth and awesome! Now, I reckon your dishwasher will be coming in handy really soon. Why do you ask? 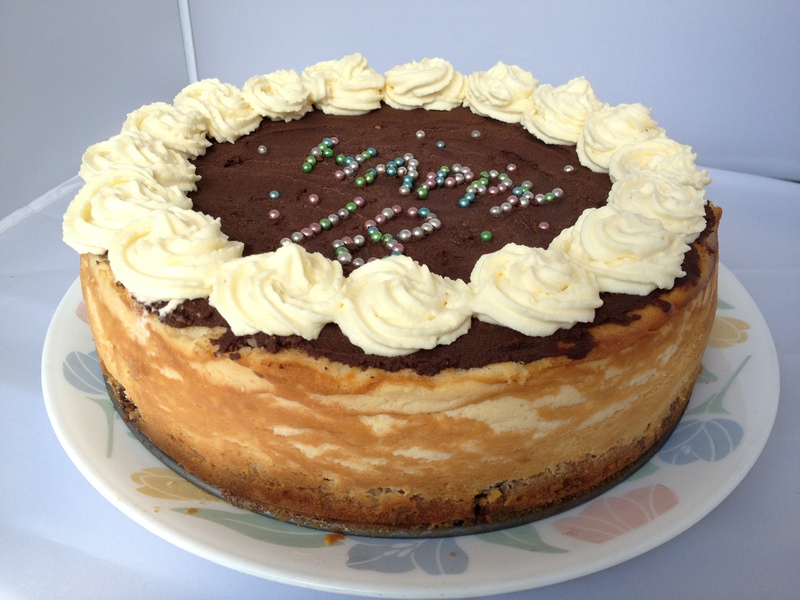 Because you will be making the cheesecake you have been seeing photos of throughout this post. But why Choc Chip Uru, what is so special about it? Oh and this cake was made for PDS’ birthday party, hence the huge amount of 18s everywhere 😛 – surely you know her by now? Preheat oven to 170 degrees C. Grease and line a 20cm springform tin with baking paper. Snap the sides of the springform tin bake onto the base with the cooled cookie crust on it. Wrap the bottom tightly in aluminium (grease from the pan or the cookie might escape) and place it on a baking tray. Voila! Place into a piping bag and pipe cornets everywhere 😀 – It sets much nicer in the fridge and is not prone to melting! Maya Oryan: You recipe talks directly to my heart!! Hello! I love your blog and I have nominated you for the Blog of the Year 2013! 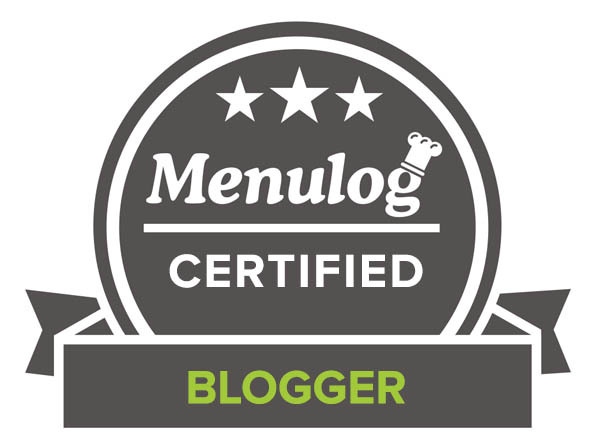 http://tastytreats13.wordpress.com/2013/11/13/awards-2/ Congratulations! Now that is a birthday cake to remember! Right down to the sparkly, colorful lettering, it looks totally amazing, and way better than the standard layer cake affair. This sounds amazing!! Also, good luck on your exams! Happy 18th Uru 🙂 I am sorry to be late here, for some reason I didn’t get email update. Sorry about that. The cake looks amazing, again. Great giveaway! All the best with your exams! Not long to go… so exciting! Great cake 🙂 Looks like I would devour the whole thing. I lvoe everythign about this cheesecake. Congratulations again! I’m going crazy staring at these pics…seriously OMG. Best of luck with your studies..gosh, I can’t even keep up anymore 😮 Guuurl I miss you! D,: Don’t stay away too long!!!! 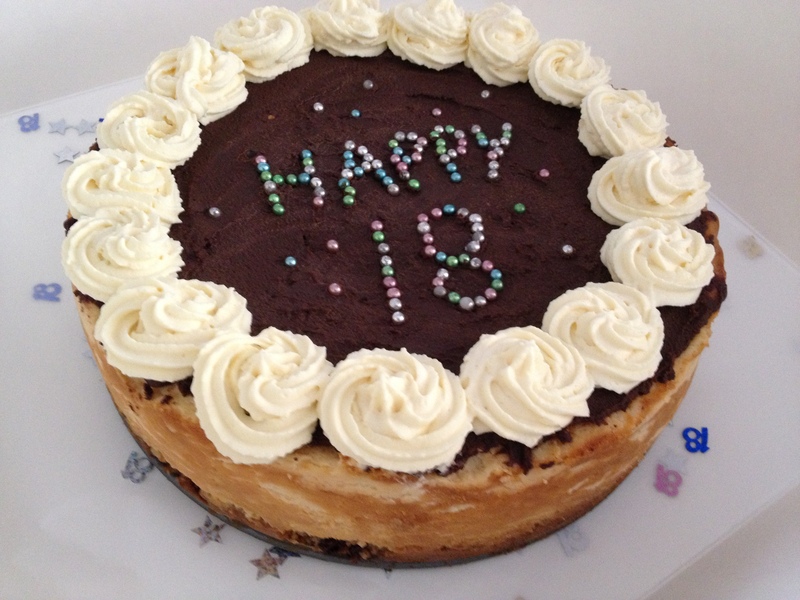 OMG, this cheesecake. I think I’ve seen something similar in my dreams before! Good luck within your exam my friend! This is such a fun cake with all the cookie dough in it. 🙂 Must be delicious and irresistible! Wow, you do have many exams. Best luck to all of them and take care. You definitely deserve a great celebration after all these exams and studies. 😉 Take care. Good luck on your exams Uru and the cake is fantastic! OH MY GOODNESS! That cake looks amazing. Did you really put cookie balls inside the cake? You’re crazy girl!!!! It looks delicious! Good luck on your exams! That’s ok. I’m just coming off a hiatus myself! Phew! When ever I hear the word ‘exam’ it still gives me shivers. No kidding, but i still get nightmares about being in the examination hall and goofing up with some or the other subject!! Amazing cake, love the sound of it. I don’t have a dishwasher sadly so it’s still all done by hand! As you can see, I too, am far far behind in my reading – but thise was SO worth it…YUM! You really know how to bake my friend! Ugg! Exams. Good luck then treat yourself to a huge bite of that delicious cake. Cheering you on and wishing you well! Also thanking you for the eye candy here. Good luck Uru! You’re almost there! This cheesecake looks incredible! Best of luck on those last tests! Good luck on your exams, I hope these are finally it 😉 That cheesecake is awesome, I bet she loved it! Good luck with the exams. Hopefully this outrageous cake will give you lots of energy. Love all the different flavours and textures. Yummmmmmmmmm! p.s. congrats on a great 2 years. Here’s to many more! What?! I’ve never seen cookie dough balls inside a cheesecake before? This is the most amazing thing ever! Anyway, wishing you lots of luck on your exams. You could do it! Almost there! So many exciting things happening for you, Uru! Great looking cheesecake! Good luck on your final exams! Your cake looks amazing! I love the flavors! Yum! Ohmigoodness, gorgeous cake! Good luck on your exams. I’m rooting for you! More exams! Well, at least you have the holiday time afterwards to look forward too! Good luck to you! This dessert looks fabulous. You are almost there, girl! Good luck! Have a slice of your delicious cake will keep you relaxing. 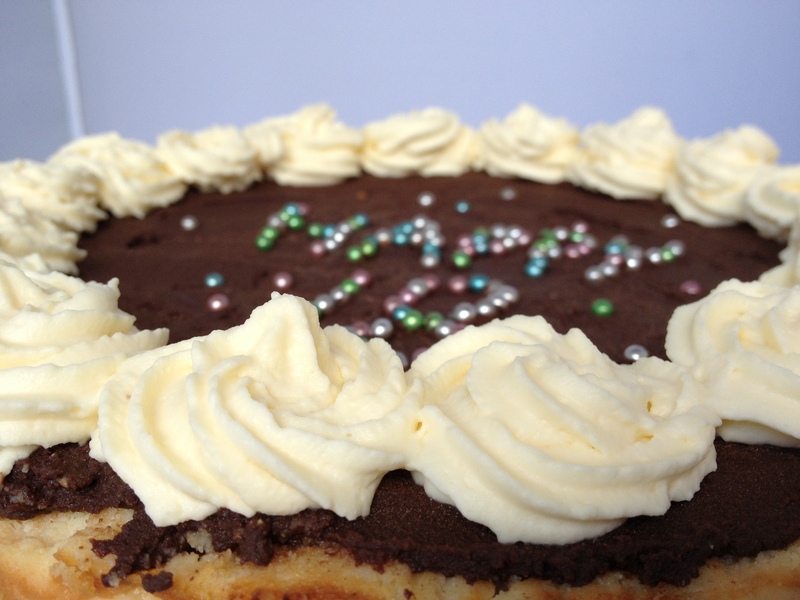 Dough balls in a cake … now that takes the cake! 😉 I thought you were finished with your exams already. Ugh … anyway blessings to you, Uru. Hope you do well. Cookie dough and cheesecake sounds like an amazing combination. Good luck with your final finals! congratulations!!! these cheesecake looks incredible! what an amazing way to celebrate! OMG! What a crazy, decadent cheese cake CCU! Over the top even for you, I dare say. 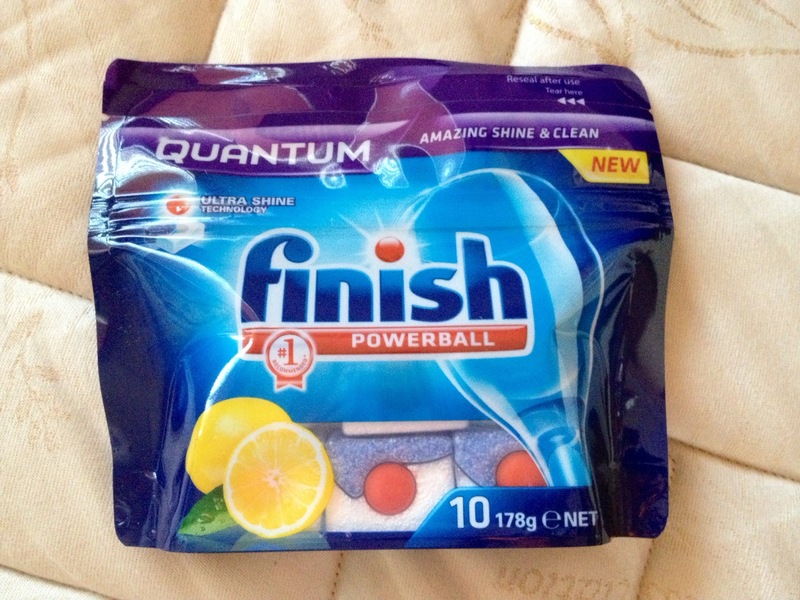 We use Finish regularly but I wasn’t aware if the lemon scented kind, would love to try it! Good luck with your exams, I know you’ll ace them! Thank you for the link to my whipped cream. Best of luck with the exams! The cake looks divine! Oh yes, best of luck to your entrants for the dishwasher tabs. I would not be without my dishwasher for all the tea in China. Girl, this is cheesecake perfection – it’s so high and decadent. I love the balls of cookie dough throughout. Good luck with the rest of your exams. I can’t wait till you’re done and you can get back to important stuff like baking and blogging! And relaxing of course, cause you deserve a vacation after all that studying! Good luck with your finals, the cheese cake looks really pretty! Good luck and that cake looks delicious! I don’t envy you… exams (especially big ones) freak me out!! I can get the cold sweats for you right now!! I wish you all the luck in the world to ace these exams and leave this chapter behind you. 🙂 Good Luck my friend!! Happy Birthday!! Interesting cake my girl. Exams..not so much. :(…Hated exams then and I feel for you. All the best and I know you will do good. I don’t have an automatic dishwasher (gasp from the crowd) so I just want to say best of luck with your finals even though you won’t need any luck, you are a smart, caring girl and will go far in the world! What a gorgeous looking cheesecake Uru. Happy Birthday wishes to your frined PDS. There are several elements that I’ve never used before in it ie the actual baked cookie crust and the cookie dough balls which I would have loved to see ‘in situ’ as in a nice big slice of the cake with the baked cake balls inside. It’s such a smart idea to use those coloured candy balls to write the birthday sentiment instead of piping it in icing. Seems like a case of the ‘boy who cried wolf’ with the end of exam announcements … I may miss the actual date. Nov 4. 🙂 Best of luck again. 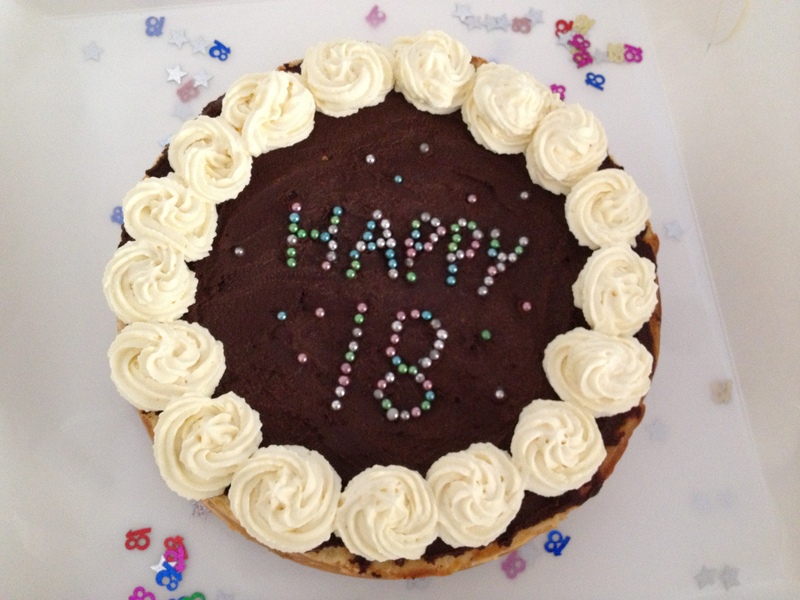 Utter and perfect decadence for an 18th birthday celebration! What a lucky friend ;-). Speaking of luck – – BEST OF LUCK on your final finals! 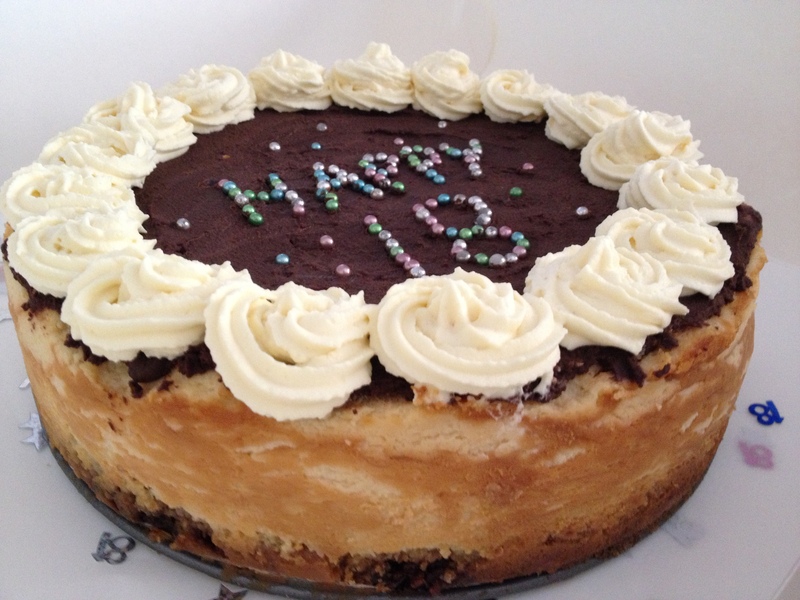 OMG, such a cool way to making polka dot cheesecake, I want to see the inside! You’ll rock those exams Uru! That is one amazing cake, Uru. Oh yes, since discovering the versatility of cookie dough, I am so hooked! I can appreciate what you must me going through with all those final, final exams. Soon it will be over:) Good Luck, Uru. A very nice give-away also. I very rarely, if ever, use my dishwasher. Truth be told, I pretty much use it for storage, lol…so please count me out from this lemony give-away. Good Luck to the winner! Congratulation to the graduation, I was never worried about that you would make it. And I know you will make the final too. Oh what a lovely cake. I’ll be glad when you’re done your exams. I always found exams to be very stressful. Good luck with it all. Remarkable cheesecake… very pretty. Uru, best wishes on your exams! Your incredible cheesecake would be a sweet reward after all the studying and waiting and wondering… hope you had time to make another one before the clock started ticking. I also agree with you, there’s nothing worse than pulling a “dirty clean” dish out of the dishwasher. Thanks for the chance to win this product! Good luck on your final exams, I am sure you will be so relieved when it is all over. What a gorgeous cheesecake Uru! Good luck on your final exams! CONGRATULATIONS! Have you received the results yet? Goodness that was a loooong time ago for me and I remember just how relieved I was once it was all over. Yippee! Another set of exams again? Gosh..I am so relieved that I don’t have to take any one! The cake looks so rich and irresisstible, Uru.